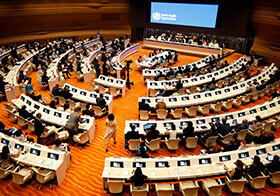 On Day 4 of the World Health Assembly, delegates made decisions relating to poliomyelitis (polio), the Pandemic Influenza Preparedness Framework and the health workforce. Side events focused on neglected tropical diseases (NTDs) and noncommunicable diseases (NCDs). Delegates paid tribute to ongoing efforts to end polio transmission in the last 3 endemic countries – Afghanistan, Nigeria and Pakistan – while expressing concern about the continued shortage of inactivated poliovirus vaccine (IPV). They also noted the urgent need to contain polioviruses in safe facilities, destroy unneeded materials, and appropriately contain resources that can be used for research or other purposes. Many delegates from the European Region made interventions during the discussions. Greece mentioned that surveillance for acute flaccid paralysis is in place in the country, including for the large number of migrants. The Russian Federation noted that, in addition to the IPV shortage, circulating vaccine-derived poliovirus is of particular concern in conflict areas. The United Kingdom asked Member States to redouble efforts to reach the goal of polio eradication by 2020. Other partners of global polio eradication efforts, including the Global Alliance for Vaccines and Immunization (GAVI), Rotary International and the United Nations Children’s Fund (UNICEF), took part in the discussions. The overarching message of the Global Polio Eradication Initiative Secretariat was that progress has been made, but is fragile. Delegates also addressed the challenge of scaling down the global polio response as eradication draws nearer. They requested the Director-General to consider polio transition planning an urgent organizational priority. France, Germany, Monaco, Norway, Switzerland and the United Kingdom all made interventions on this topic. Future actions will include fully briefing the Director General-elect and his team on the polio transition, developing a detailed transition plan, and ensuring that the transition is adequately reflected in other areas, such as immunization and surveillance programmes. Norway and the United Kingdom made interventions during discussions related to financial matters, as well as audit and oversight matters. Member States recognized WHO’s work to improve transparency and accountability, while underscoring the need for further work on implementing recommendations in this area. The draft decision recommended by the Programme, Budget and Administration Committee of the Executive Board was approved. A number of Member States, including Turkey, made interventions to express concern about the health of mothers and children in these territories, lack of access to hospitals, and nonfunctional health systems. They also condemned attacks on health facilities. Israel noted that it prepared, at WHO’s request, a comprehensive review and report of the situation in the Syrian Golan. The report indicates that many Syrians fleeing their country are coming to Israel for health services. Several European Member States expressed concern that this report was not published, at the request of the Syrian Arab Republic. A side event on building capacity for innovation and access to combat NTDs featured a range of multisector stakeholders. It aimed to identify opportunities for better implementation. Switzerland, among the delegations that organized the event, commented that it believes in the mission of the World Intellectual Property Organization, which is launching a new strategic plan for research on NTDs. Dr Bente Mikkelsen, Head of the Secretariat for the WHO Global Coordination Mechanism on NCDs (GCM/NCD), opened a side meeting on the GCM/NCD by describing the history of its creation and outlining its 5 objectives. Norway commented that, within the SDGs, WHO is required to work across sectors, and that the GCM/NCD also needs to focus on working cross-sectorally. Its working groups present a great tool for accomplishing this. France remarked that the GCM/NCD is a good mechanism for fostering collaboration and accountability, but more accountability mechanisms are needed. Dr Oleg Chestnov, WHO Assistant Director-General for Noncommunicable Diseases and Mental Health, noted that nongovernmental organizations are making strong contributions to the GCM/NCD. A number of other stakeholders, including PATH, UNICEF, the World Economic Forum and others, shared perspectives. One of the event’s overarching themes was the need to make the GCM/NCD effective at local levels, recognizing that it should catalyse national coordinating mechanisms.